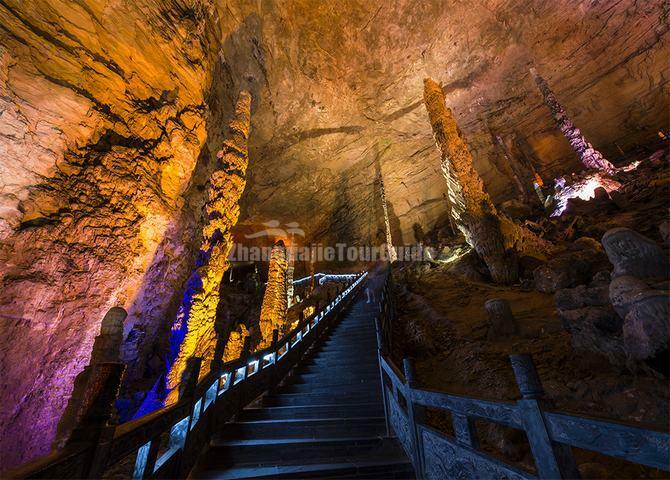 The Yellow Dragon Cave is 30 kilometers away from Zhangjiajie City. It was discovered by eight local youth militias in 1983 and officially opened to the society on October 1, 1984. The cave is about 30 kilometers long, 80 meters wide and average 50 meters in height. 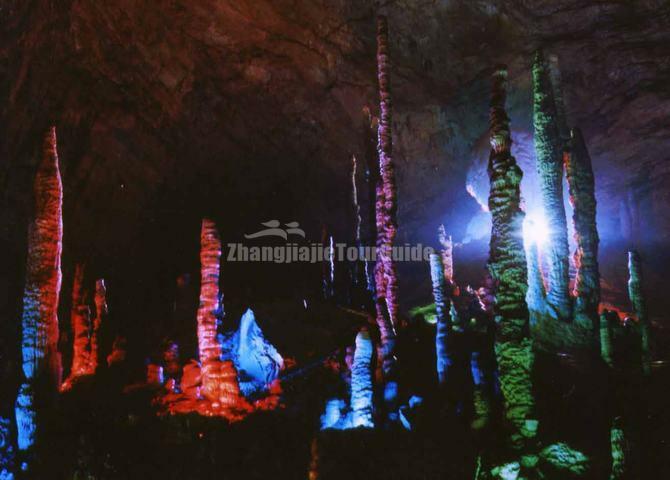 It shocks the world by having top honor of "cave wonders of the world", "cave all-around champion of the world" and "China's best tourist cave". The cave with huge scale, rich content and beautiful scenery, is rare in the world. It has been proven that the cave’s bottom has a total area of 100,000 square meters and can be divided into four layers. Dragon Palace is one of the biggest in the 13 main halls in Yellow Dragon Cave, covers an area of 15,000 square meters, 40 meters high on average. In the backyard of Dragon Palace, there are gold and silver lotus ponds, water often overflow and flowers in full bloom. Bruinen River is an underground river in the second floor of Yellow Dragon Cave, the total length of 2,800 meters. It takes about 8 minutes to finish a boat tour in the river. The average water depth in 6 meters, water temperature around 15 degrees Celsius all the year round, it is rich in national level 2 protect animals giant salamander and translucent glass fish. The sign attraction of Yellow Dragon Cave is "Key Stand", up to 19.2 meters; it is coarse on both ends and thin in the middle, among the thinnest only 10cm in diameter. According to the calculation it has been growth in two hundred thousand years. A peak, sandstone overlap on the top, leaning against the blue sky, like a Luo Han sit in the south, baldness, round face, smile, paunchy, bend his knees and cross-legged, with his hands Da Gong on his chest, just like to greet the guests. On a west stand concave of cliff, there is a more than 20 meters high round peristele stand out at right upper, surrounded by steep and the top is a platform. It has 5 pine trees around a piece of 3 meters long, 1.5 meters wide, and 80cm thick box shaped stones. The stones covered with a slate which is the same length as the box, like a box cover, about 10 cm thick, half cover on it and half is dangling. Two stones just like half opened ancient books box. "Pagoda Peak", which is used for uphold the good and suppress the bad by dragon king. In front of our eyes appeared two stalagmites with yellow and white color, this is the dragon king weapon of war "Jin Ge Yin Qiang". At the top of the right side of gold dagger-axe, there is a goddess of mercy and a group of monkeys are climbing upward along the stone, so called "group of monkey worship goddess of mercy". The spring in the Yellow Dragon Cave called Yellow Dragon Spring, often flow constantly year after year, sweet and tasty, and left many beautiful legends for the world. According to the legend, a long time ago, the local drought which has not happened for one hundred years, under the lives of the people, master He Jun Ru enter into the cave to praying for rain with his Shi Dao, the dragon king saw his sincere, then a few drops of rain out of his mouth and there is a rain outside the cave at the same time, but master He thought that dragon king will not save the drought, so he picked up the knife and toward it to the dragon head. The dragon king was unhappy and spited water more and more, at the same time there is a flood inside the cave and outside the cave. For master He escaped from the cave, he realized that he was bruised all over the body; also his beloved Shi Dao had left in the cave. More importantly village was washed to the wasteland and folks were washed to separate. Master He regretted his original recklessly, and then he carved "Gan Si Dang Men Tian, Mo Da Yellow Dragon Spring" in the mouth of the cave, he died with hatred. Since then, people afraid of talking about the cave.